Casa Amarilla is a beautiful Caribbean home, tucked away on a private and quiet road under the rainforest canopy. If seeing wildlife and monkeys is a priority, one can't possibly do better. It is located right underneath one of the region's main monkey corridors, where you are almost certain to see three species of monkeys everyday! 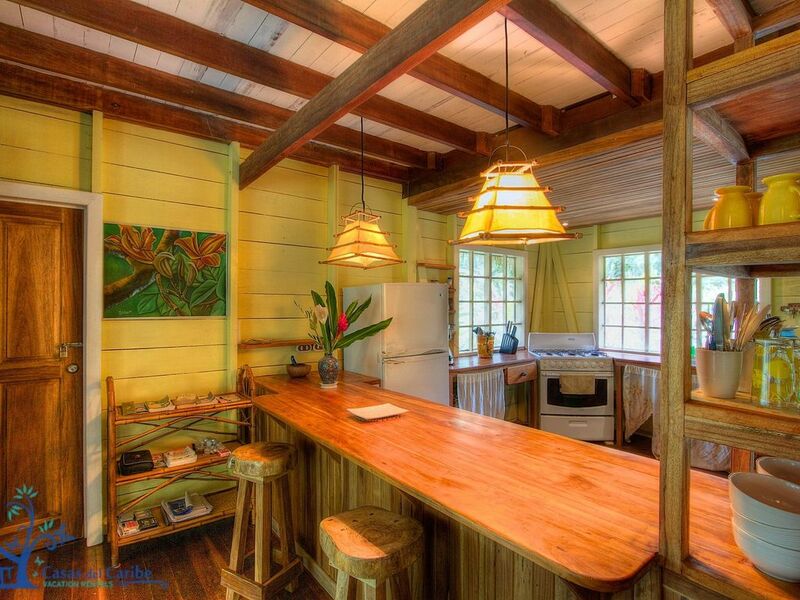 This comfortable Caribbean Jungle House has 2 separate bedrooms upstairs, each with its own bathroom and a large wooden terrace overlooking the back yard. The downstairs includes a spacious kitchen, living room and covered outdoor sitting area. On one of of the living room is a day bed / sofa for additional guests. Enjoy your morning coffee on the back porch in your hammock while viewing the daily visitors which include the howler, white faced and spider monkeys. Also common are the morpho butterflies, toucans, many birds, and agoutis, amongst a long list. Cancellation Policy	If you find it necessary to cancel your reservation, we charge a $50 cancellation fee. We will refund the balance of your deposit, less any banking fees, within 2 weeks of your request. If you cancel within 60 days of your reservation date or no-show, no refund is available. Should you arrive and not stay the length of your reservation, no refund is available. Reservations	In order to reserve, we require a 50% deposit. Please click HERE to make your Paypal deposit payment. Any Paypal payment processing fees will be deducted from the final amount at Check-In. We really enjoyed Casa Amarilla Jungle Home. The setting is in the jungle with different kind of animals, including monkeys visiting regularly. The house is very comfortable and gorgeous, although it looks like it could use a new stove and pots and pans. It is an ecolodge( no flushing toilet paper but you get used to it) You don't need a 4 wheel drive to access this house. I suppose you could just rent bicycles, the town for the shopping is at quite a distance. There is access to 2 different gorgeous beaches at a 10 minutes walk. There are no air conditioners in the house but we felt totally comfortable for our stay in the month of March. The agency is quick to answer your questions and the people are really nice . We will certainly rent this house again in the future. We stayed at Casa Amarilla for a few nights and we loved it!! We were traveling with relatives from Canada and Punta Uva was our first stop in Costa Rica. When we arrived and they saw the jungle in the back and that when opening up the doors you could completely connect the indoors with the outdoors they were a bit scared at first but loved it afterwards! At sunset or sunrise it is amazing to stay at the second floor terrace and listen to all the jungle sounds. The beach that is just a few blocks away is gorgeous and on the way to the beach there is also a grocery store where you can find most of what you need for your stay. The house is as nice as you can see in the pictures and is well equipped. We were looking for a house that had the typical caribbean vibe but new and clean and we certainly found it. The only thing we found a bit odd was the first level layout because the bed is in the kitchen area. Maybe a low wall or even having a sofa-bed could add more privacy or disimulate it a bit. But the truth is that at the end of a day at the beach you are do tired that everyone goes to bed at the same time. We look forward to coming back! We loved Casa Amarilla, staying there for twelve very fun filled days. The Howlers awakened us and the Spider and Capuchin monkeys swung by to entertain us. We were a short walk from the beach and great hiking was just out our front door. The four of us found the casa very comfortable. The kitchen was not as well equipped as other places we stayed in Costa Rica, but we were able to prepare all of our meals with no problem. We hope to return to this perfect location next year. Yes indeed this bungalow is absolutely as beautiful and clean as pictured- nestled in the monkey/sloth/toucan-filled jungle, just a ten-minute walk to a quiet beach with gentle body-surfing and lots of snorkling around the coral reefs. Renting bikes was delightful and the hosts are very gracious in answering all questions and meeting requests promptly. Livelier Puerto Viejo is nearby, and wonderful restaurants, smashing surfer waves, and supermarkets also abound- but far enough away for this to be a delightful and private retreat. The entire community reflects a welcoming, open and safe atmosphere. My wife, my son, and I stayed here for about a week over New Year 2010. We loved the openness of the place, and the feeling of being off on our own at night. We had plenty of monkeys in the immediate area, passing through all of the nearby trees. I hope that we return again. Great beaches in the area, and Puerto Viejo is a short drive away. Punta Uva, where the Gandoca-Manzanillo Wildlife Refuge starts. The coast is composed of two bays, separated by Punta Uva point. You will find to the south the district of Arrecife, and to the north a large bay surrounded by jungle vegetation. This is one of the best spots within the region for snorkeling. Don't miss the river kayaking. A small road of about 6 km "Paraíso road", leaves from Punta Uva and crosses the hills to join the road leading to Bribri at the border with Panama.